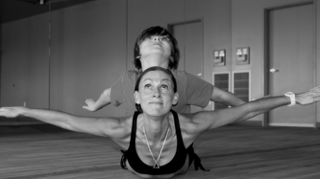 A native Michigander, Gretchen came to her Bikram practice in the spring of 2006. It was an instant connection she found with this yoga practice. Though, as you can relate, we talk ourselves out of the practice from time to time. After, many starts and stops she finally understood the power of a consistent practice and how it literally transforms your life...if you let it. This is a huge part of her teaching style . Often giving the "you are worth it!" sermon on the podium. You all have most likely heard of her "on again off again" relationship with her Bikram practice, or how it continually supports her in her relationships and work as a mother and "stewardess". After years of running and an intense 4 year college volleyball career ending with a knee injury, it was this yoga that would end up healing much more than a bum knee. The physical healing of Bikram yoga is obvious to most but the emotional healing that happens is beyond The Physical. You will find her humor and compassion a joy in class! Danelle is also a Michigan native who flocked to the west at an early age. She began her Bikram yoga journey in 2001 right here at Bikram Yoga Fremont Street. With her strong connection to the practice she soon knew that becoming a teacher was in her future. She attended teacher training in the Fall of 2006 and never looked back! Since training, Danelle has spent her time growing as a teacher, student and human being. Becoming a yoga teacher was just the first step in her leadership role. She is a mother, a certified massage therapist and also a Reiki Master and teacher to many. She has a strong knowledge of the human body and diverse therapeutic massage practice, including sound healing and Celtic Shamanism, which has a strong foundation in the study of the runes. These attributes along with her energy work, together are a big part of her teaching style. Danelle has built the strong foundation needed to now move into yet another leadership role.